Have you ever had a color obsession? You find yourself being drawn to it unintentionally no matter the item? That's the moment I'm having with mint. It's not the most practical color and I certainly wouldn't call it a neutral but I can't.get.enough. So much so that I've incorporated into my home decor! It's fresh and bright and a little unexpected. So when this pretty necklace showed up at my door I knew it had a big future. 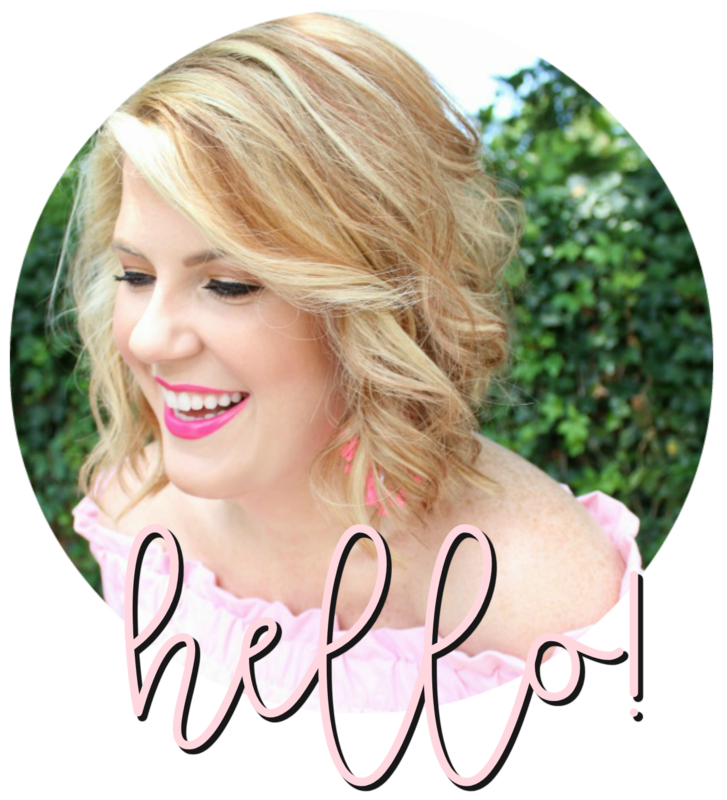 I'm really excited to kick off this week by introducing you to Madeline of Poppy Style. Her online shop is bursting with amazing pieces at even more amazing prices - including this tortoiseshell necklace, these classic gold earrings, this cuff and the chunky mint link necklace I'm wearing! Miss Madeline has been so kind to offer a $75 gift card to her shop to one lucky reader! Simply follow the steps below to enter! She's also offering an amazing discount for everyone! 15% off and free shipping with code julie15. Happy shopping and good luck! I would get the barlcay bracelet in white, the heart cuff, Cherokee necklace and/or the sideways cross necklace. It was so hard ot chose just one thing! I really liked the morrocroft earrings! I like the Tortoise Link Necklace and the Morrocroft Earrings! I love that necklace. Anything mint has my heart these days! Julie, you always point be to the best jewelry shops! I love you for that! (my accountant a little less, though ;) Anyhoo, you look absolutely fantastic, as always. Mint suits you really well, and I die for that necklace! 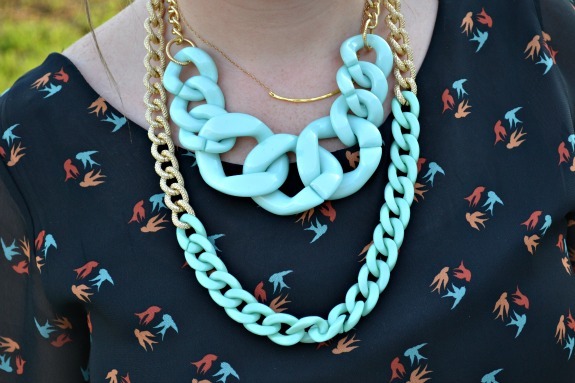 I am loving the Brunswick Necklace! Perfect colors for summer! Great giveaway! Love the Sherwood bracelet and the Cherokee necklace. I like the Charlotte Necklace. I will definitely be scooping up the Montford Earrings first thing, they are just the pair I've been looking for! how do you choose? love the bromley necklace in particular..it would take me a while to decide though! Loving the Charlotte necklace. Great giveaway! 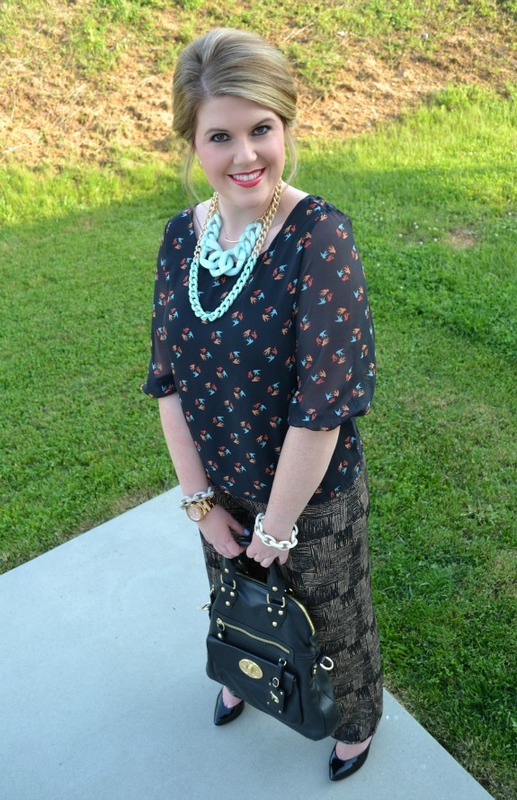 Love the tortoise shell links necklace! loving mint everything these days!!! Love your blouse! I seriously love your hair have you ever thought of doing a how to on your hairdo? I am also on a serious mint crush right now. It goes with everything in my opinion. That necklace looks great on you Julie! Thanks for sharing this with everyone! the knot bangles and gold cuff for certain! The cuff is so wonder woman! Oh, I love the Foard Necklace, Wendover Necklace & Park studs! The necklace looks beautiful on you. Adorable! I love your hair up like this! 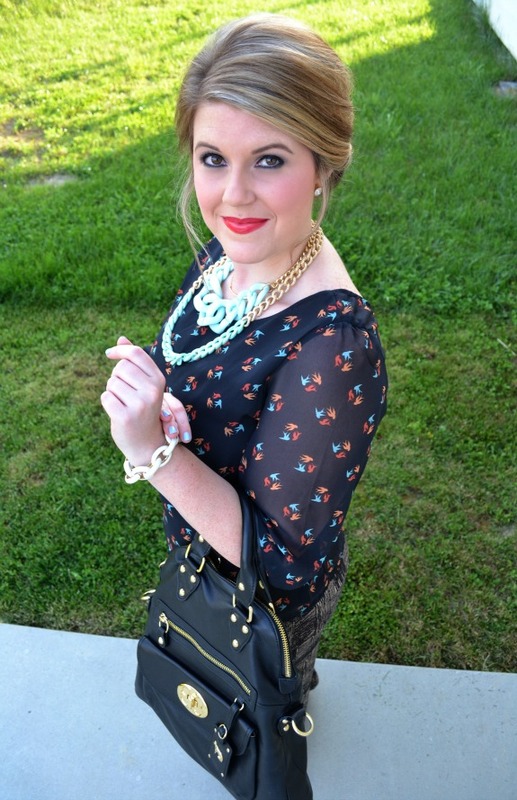 i love the weddington necklace! I think I would get the knot earrings and the infinity necklace. So dainty! I'm crazy about all the bracelets! In particular, the Sharon Cuff & the Barclay Bracelets.